The Round Wooden Greek Lambda Shield is a classical representation of an ancient Greek shield. Featuring the Greek letter Lambda, this shield is a quality, hand-made item that is both attractive and fully functional. This shield is reminiscent of the shields of Sparta, featuring the Greek letter lambda as it does. The letter is depicted in red and outlined in black and is set against a rich, metallic-gold background. This gives the shield an intriguing hammered metal appearance. The border of the shield consists of alternating red and black triangles. This shield is both decorative and fully functional. It measures approximately 25 inches in diameter and is made from 0.5 inch thick smooth composite wood, which ensures the shield has more strength and durability then regular plywood. The back of the shied features a pair of leather straps that allow for convenient carrying and use of the shield. One leather strap loops around the forearm while the other is meant to be gripped by the hand. The front of the shield also features several layers of varnish as a topcoat, which provides an added level of protection against the wear and tear of time and use. This shield is exceedingly well-balanced and performs exceptionally well when used in a combative scenario. 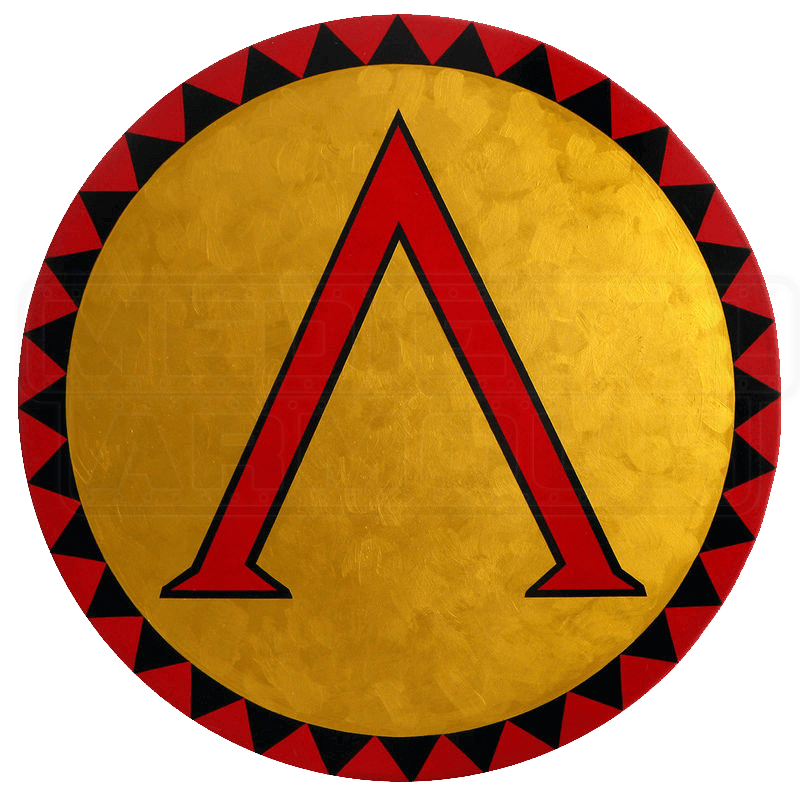 The Round Wooden Greek Lambda Shield is a high-quality item that can and will perform in any capacity you place it in: use it in battle without fear or hang it on your wall with pride.